India election 2019: Do more Indians than before have access to toilets? India's BJP government has undertaken a highly ambitious project to build tens of millions of toilets across the country. The practice of defecating in open places - in fields, waste ground or in rivers - has long been blamed for the spread of disease. It also puts women's safety at risk when they go out under cover of darkness to relieve themselves. Claim: India's prime minister, Narendra Modi, says that under his Clean India programme 90% of Indians now have access to a toilet, up from 40% before he came into office in 2014. Verdict: It's true there's been a large increase in the number of household toilets built under the current government. But there's also evidence that for a variety of reasons, not all toilets are being used or are functioning properly. 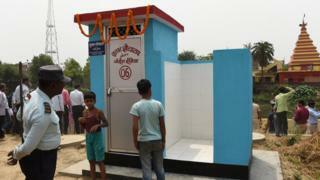 •Rural Clean India - aims to stop the practice of open defecation in villages by making toilets more accessible. •Urban Clean India - to ensure there are toilets in homes and public places and to manage solid waste disposal in cities. The available government data shows that by November 2018, 96.25% of homes had their own toilets. This is up from 38.7% in October 2014. An independent survey carried out in rural areas between November 2017 and March 2018 found that 77% of rural households had access to toilets and 93.4 % of the people who had access to a toilet used them regularly. The government's Clean India Mission says that 27 states and union territories out of 36 are now free from the practice of open defecation. But while there is plenty of data on toilet construction, there are still questions about actual usage. Having a toilet installed in a household does not always mean it will be used, or that the practice of defecating in the open has stopped. The government's main data-collecting body - the National Sample Survey Office (NSSO) - reported that of those households getting new toilets in 2016, 5% were not being used and 3% had no connection to a water supply. The secretary for the Rural Clean India Mission, Parameswaran Iyer, has told the BBC that he believed things had improved since then. Many toilets have a single pit latrine or septic tank, which fills up after five to seven years, rendering it unusable. Bad construction and poor maintenance mean some toilets are non-functioning. There are also issues around targets and official data. As an example, Prime Minister Narendra Modi announced in 2015 that all government schools now had separate toilets for girls and boys. But according to the Annual Status of Education Report published in 2018, nearly 23% of government school toilets were not useable. Will India's bullet train run on time? Will India become the next manufacturing superpower? India election 2019: Is the switch to gas in the kitchen working? BBC Marathi service did its own investigation in 2018 into the official assertion that the state of Maharasthra was free of open defecation. They found that 25% of households in one village did not have access to toilets, and were having to go to the toilet in the open. Shortly after the BBC story was published, the local authorities provided more toilets. Other reports also throw into doubt government claims about ending open defecation. For example, the state of Gujarat was declared free of open defecation on 2 October, 2017. But almost a year later, an official audit said 29% households did not yet have toilets. An important part of the government's programme is aimed at changing habits. This is harder to measure although anecdotal evidence suggests there are behavioural issues in some places. A local official in the state of Uttar Pradesh recently told the BBC: "People have constructed toilets, but still do not regard them as a part of the house. "And in many homes, older people avoid using them as they don't find them comfortable enough." A survey published in January this year looked at this issue in four northern Indian states: Bihar, Madhya Pradesh, Rajasthan and Uttar Pradesh. It said that almost a quarter of people in households with latrines still defecated in the open.